When you travel along the northernmost sections of Argentina’s Ruta 40 highway, you will drive at heights that exceed 2.000 meters (6,560 ft) above sea level, and once you go above that elevation, you may begin to feel the first symptoms of Acute Mountain Sickness or (AMS), also known as altitude sickness or, in Spanish "Apunamiento" or "Soroche". We will give you tips on how to mitigate its nasty effects. Read on. The northern legs of Ruta 40, starting at the Cuesta de Miranda pass in the province of La Rioja, (2.040 m - 6,690 ft. above sea level), become higher and higher. 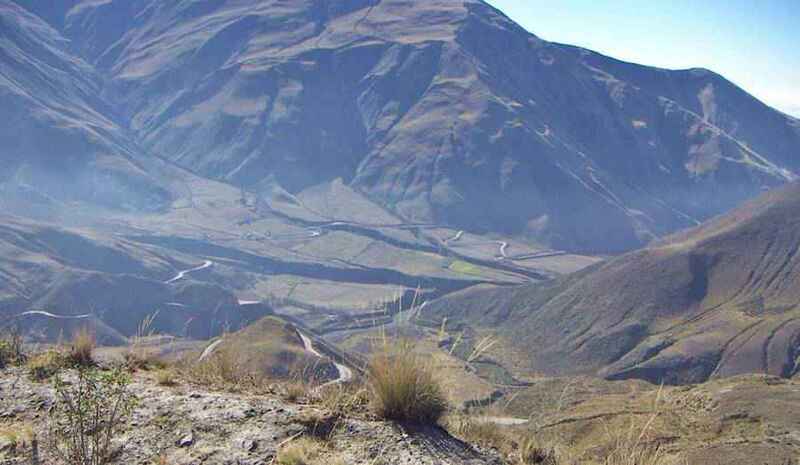 At Punta de Balasto and again in Salta in the Calchaqui River Valley, the highway reaches altitudes above 2,000 meters. It then climbs until it reaches its Highest point at the Abra del Acay Pass, where it is 4.895 meters, 16,050 feet above sea level. These extreme altitudes can cause Acute Mountain Sickness due to the lack of oxygen. This "sickness" is how your body responds to the lack of oxygen (hypoxia) and the lower atmospheric pressure in high-altitude environments. At sea level air contains roughly 21% oxygen at an atmospheric pressure of 1 atmosphere. This is equivalent to a pressure of 14.7 pounds per square inch on your body. As we climb away from sea level, as there is less air above us, atmospheric pressure drops. 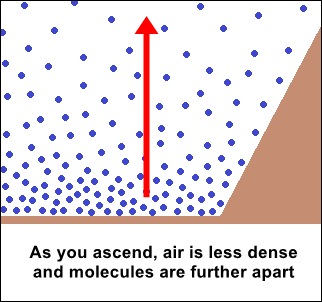 This can be seen in the image: the molecules that make up air are spaced further apart as you go upwards, and the same volume of air contains less molecules. However the proportion of oxygen remains constant: it stays fixed at 21%. The problem is that as atmospheric pressure drops, there are less molecules of air in the same volume and as oxygen makes up 21% of those molecules, there are less oxygen molecules in a given volume of air. So each breath you take holds less oxygen. At an elevation of 3.600 meters above sea level, (11,800 ft), the atmospheric pressure drops to 63% of its sea level value and the oxygen content falls by 40% of what it was at sea level. But our body's oxygen requirements have not changed and we start to pant or breathe faster trying to intake more air (and oxygen) to keep our bodies alive. Our heart will beat quicker to keep our body's cells fed with an adequate supply of oxygen. This causes stress on our body's vital systems. Another problem we face at high altitudes is that as the atmospheric pressure drops inside our lungs, fluid may flow from the blood vessels that irrigate the pulmonary alveoli and pass into the lungs themselves. This makes it even harder to breathe. The High-altitude pulmonary edema (HAPE) (HAPO spelled oedema in British English) can be a life threatening condition in otherwise healthy people at altitudes above 2,500 m (8,200 ft.). Some people are more susceptible than others to suffer from HAPE which can even appear in well trained climbers if they climb too hight too quickly. HAPE seldom occurs on the first day in high altitude places. Onset takes place some 36 to 72 hours after reaching such a place. The main symptoms of HAPE are fatigue, cough and foamy sputum. If it is not treated, it may cause death. Below is a photograph of the Cuesta del Obispo, close to Cachi in Salta: it's highest point is known as Piedra del Molino and its altitude is 3.348 meters - 10,977 ft. above sea level. Gaining high altitudes very quickly is one of the causes of altitude sickness. The wonderful part is that the human body can adapt and adjust to a lower amount of oxygen after a few days (usually from one to three days). Your body produces more red blood cells to carry oxygen more efficiently. And it produces larger quantities of an enzyme that mediates the release of oxygen from the red blood cells' haemoglobin into the surrounding tissue. Altitude Sickness during a Flight? Modern planes usually fly at an altitude of 30,000 ft (10,000 m) and therefore their cabins are pressurized, but the internal pressure is much lower than the normal sea level atmospheric pressure. This is because if they did so, the cabins would have to be reinforced and would way more, using more fuel to fly, take-off and land. So the cabins adopt an intermediate pressure of around 8,000 feet - 2.440 m. Though some measurements have given average values of around 2.717 m (8,940 ft). That is why sensitive people may suffer from altitude sickness during a flight, and should follow the tips given below. The medical name for the condition in acute mountain sickness (AMS). Roughly 75% of us feel light symptoms once we reach an altitude of 3,000 meters (9,836 ft). Eleder people and young children (under the age of 6) are more susceptible to it. These symptoms usually dissappear after you have adapted to your new high-altitude enviroment or, if you descend to a lower altitude. If you are driving, do so with care and try to acclimatize yourself before going above 3,000 meters. Take your time to climb to high altitudes. Climb high up but sleep low down. A good strategy is to visit the high altitude locations during the day, but to sleep at towns located at lower altitudes. If you feel any slight symptoms. Stop climbing until these symptoms have gone away. If your symptoms don't improve or worsen, go to a lower altitude immediately. Descend as quickly as you can and seek professional medical help. Keep hydrated. Altitude provokes loss of body fluids (and a dry climate like that of the Puna and Northern Argentina promotes dehydration). Drink plenty of water (4 to 6 litres per day - 1 to 1.5 gallons). Dehydration thickens your blood, making it more viscous and causing your heart to beat stronger, this is risky. It also makes it harder for your body's cells to eliminate toxins. Caffeine, alcohol and cola soft drinks and sodas are diuretic beverages and cause loss of fliuids. Gas from sodas will expand inside your gut as you climb due to the lower atmospheric pressure, causing bloating and flatulence. At first avoid heavy exertion, keep activity to a minimum. Eat a diet that is rich in carbohydrates (sugars and starches) such as jams, marmalades which are easily digestible. Eat small portions frequently. Keep warm, Puna climate is harch and cold, even during the summer. Visit your doctor before you travel. Coffee, tea or even coca leaf tea may mask the altitude sickness fatigue but it will not prevent AMS. The site does not provide medical or legal advice. This site is for information purposes only. The medical and ⁄ or nutritional information on this site is not intended to be a substitute for professional medical advice, diagnosis, or treatment. Always seek the advice of your physician or other qualified health provider with any questions you may have regarding a medical condition. Ruta 40 (Argentina) Online Travel Guide: Information on accommodation, sights, attractions and destinations. Itineraries, tours and resources for planning your Route 40 Road Trip.